Legend has it that Derek Trucks bought his first guitar for five dollars at a yard sale when he was nine years old. Struggling to get his small hands to form chords on a full-size guitar neck led him to learn using a slide. A genuine child prodigy, Trucks had his first paying gig at 11, and by the time he was 13 had played alongside no less than Buddy Guy. By age 15 he had started his own group, the Derek Trucks Band, and had begun sitting in with his uncle’s band—his uncle being Butch Trucks, longtime drummer for the Allman Brothers Band. By the time the Allmans made him an official member at age 20, in 1999, he had played with Bob Dylan, Joe Walsh, and Stephen Stills, among others, making his mark with soaring, deeply expressive slide playing that counts Duane Allman as a major influence. Not long after formally joining the Allmans, Trucks met blues singer-songwriter-guitarist Susan Tedeschi when she opened for the group. The pair soon married and had two children. After juggling parenthood and their individual musical careers for several years, in 2007 Trucks and Tedeschi tried out the concept of playing together by temporarily merging their bands to tour as the Soul Stew Revival. 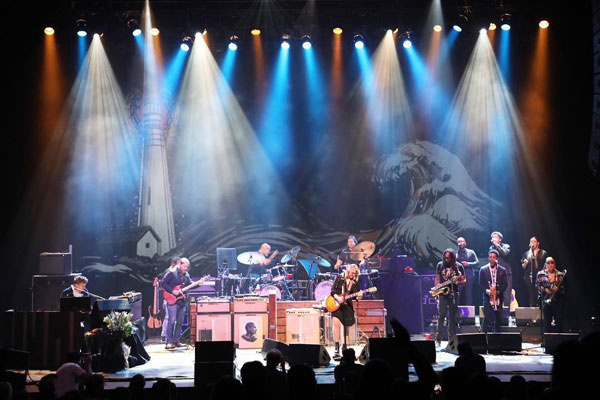 For three years Trucks and Tedeschi alternated solo recordings and tours with short runs of Soul Stew Revival gigs, before they both put their solo bands on hiatus and formed the 11-member strong Tedeschi Trucks Band in 2010. Over the past nine years, the TTB has issued four studio albums and two official live collections, while wowing audiences across America and around the world with their heady mix of blues, Southern rock, soul, and jammy, expansive roots music, fielding a lineup that’s now up to an even dozen, including twin lead guitarists Trucks and Tedeschi (with Tedeschi taking most lead vocals), keys, bass, two drummers, three background vocalists and a three-person horn section. The band is in the midst of a yearlong tour in support of their fourth studio album, Signs, a powerful collection of tunes exploring themes of loss, grief, determination and resilience. The grief piece of the puzzle is real and still fresh, marked by the passing of both Derek’s uncle Butch and Gregg Allman, as well as friends and inspirations Leon Russell and B.B. King, Susan’s friend and mentor Colonel Bruce Hampton, and most recently, Trucks’ musical brother and TTB keyboardist / flautist / songwriter / arranger Kofi Burbridge, who played with Trucks for two full decades. The accolades for Trucks and the TTB have been abundant. In 2010, the Derek Trucks Band won the Grammy Award for Best Contemporary Blues Album for their 2009 album Already Free. In 2012, the Tedeschi Trucks Band won the Grammy for Best Blues Album for the TTB’s debut album Revelator. And in 2011, Rolling Stone’s “The 100 Greatest Guitarists of All Time” placed Trucks at number 16. 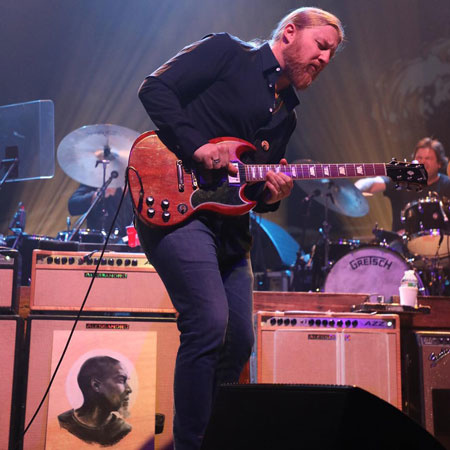 We caught up with Derek Trucks briefly back home in Florida last week as the Tedeschi Trucks Band was preparing to launch the European leg of the Signs tour. Daily Vault: One of the many things Signs does well is give everyone in the band a chance to shine, without the songs ever feeling crowded. The lineup is so large and versatile that you can feature a lot of different types of arrangements and you guys seem to have great instincts for when to add more and when to leave space. 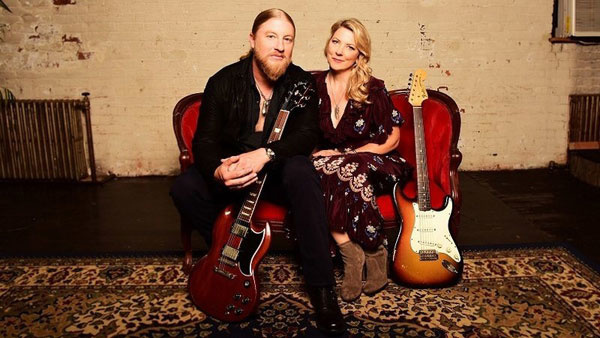 Derek Trucks: I think that just comes with time and doing it more and more. You learn everyone’s strengths a little bit more, and then I think you start learning how to write for that. Not all songs are written that way. A lot of times you write a tune and it’s an acoustic guitar and a voice or a few acoustic guitars and a voice and you just imagine what the band will sound like. Everyone just folds into it. There’s a few tunes on the record, like the kickoff track, where the first instinct when we started playing that groove was “This could be like a Sly and the Family Stone, pass the vocal around thing.” And it doesn’t feel forced, you know, everyone gets a piece and it also felt like a good way to kick off a record. 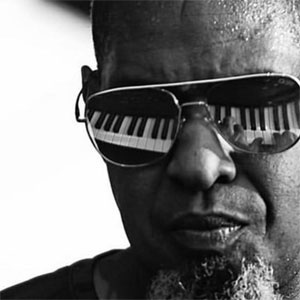 It starts with Kofi [Burbridge, playing a snappy little clavinet riff], the band comes in, and you feel the size of the band, but you can see everyone’s face, you can feel everyone’s personality right out of the gate. And then after that, you don’t have to overthink it. Once everyone’s been established, then it’s easier to fold them in here and field them there, because it’s a little more obvious on the first track. So that was a bit of the concept behind that. Sly and the Family Stone is kind of an obvious reference; the band feels like it's almost a modern parallel to them. Signs came about during a period when your band family was going through one loss after another. How did that influence the album? All of us as a band, but definitely me and Sue as the songwriters in the band, we all wear our emotions on our sleeve, and when you’re going through things, that’s what you’re going to be thinking about and writing about. At its core, you’re always just trying to keep it honest, whether it’s the music or the songwriting. It was a tough little period there. And it was odd that that was the sentiment of the writing on the record, and then on record release day, Kofi passes away. It just kind of reinforces that in a strange way. The record was a mix of unpacking a lot of the losses—family and friends and our closest musical mentors, people you based your whole musical outlook on. It was that, and also there’s a little bit of hopefulness under the surface. A lot of it was that we were really appreciative and felt blessed that Kofi was back with us, because he had just gone through a bout of bad health, and really the first thing he did after that was to do a few shows with us and then we hit the studio. A lot of it was, we were just really happy to have him back and playing and writing with us. He wrote all the strings and conducted the quartet in the studio and there were a lot of moments when we were making this record where you felt that sense of, I didn’t know if this will ever happen again. And how fortunate are we that he’s here. All of it’s pretty bittersweet at this point. I personally focused on it being a bit of a “Kofi record” in the sense that the record starts with him in the clear, and then all the string arrangements he did, that are some of my favorite moments that we’ve recorded to date, especially the one in “Strengthen What Remains,” there’s just a beautiful little instrumental section and then his really short flute solo is just near-perfect. We planned the record release in his hometown of Washington, D.C. and then he got sick again, and two hours before our gig on the release day, Kofi passed. All of it’s been a bit overwhelming, to be honest. That’s a heavy sequence of events. He never made anyone feel that way, he was always in your corner. But yeah, that’s a tough one to unpack. I just feel incredibly fortunate to have spent that much time with him, and to have made that much music with him. Certainly a big portion of my life and career I owe to Kofi directly. He was one of those guys who can make a decent idea pretty damned good, and a good idea great. Whatever he did, he just made it instantly cooler and more legitimate. When you have that kind of confidence and you have that in your corner from a young age, I think it gives you a little bit more fearlessness to just keep charging through. So now it’s our job to keep charging through. That’s a great legacy for him. Yeah, he got a lot done. He was only 57 when he passed, but he got a hell of a lot done. He did a lot of stuff before I met him, and while we were together, and he’s got a pretty big legacy out there. It really hit me after he passed how many people felt it, and how far and wide they felt it. Just the number of musicians that were reaching out and every night on stage for that tour, people were showing up with flowers and putting them in front of his B3… it was an intense run. It was hard getting through every show, but it felt like it was necessary. And you realize that everywhere we go for a good while now, it’s going to be a lot of people’s first chance to really face it. You hear about somebody passing, but then you go see his rig on stage, where he was standing for years, and it becomes real, real quick. It’s going to be a heavy year of touring that way, but, you know, he deserves that. It’s a small price to pay to get up there and feel that weight and take it on the chin every night, for the amount of time we had with him. Yeah. Turning back to the band, it’s been fascinating watching as you and Susan had your solo careers, guesting on each other’s records, and then playing live together as the Soul Stew Revival, and then merging your bands into the Tedeschi Trucks Band. Did that feel like a natural evolution? It did. I think from the moment that we met and were together there was always this notion that we should do something together. But we were deep into our solo careers and there was a lot of meat on those bones and I don’t think, musically, we were done yet. It was just kind of a thing in the back of our heads the whole time and when we did the Soul Stew Revival, I think a lot of that was us just feeling it out. We wanted to see how it would feel to be on the road as co-bandleaders. We were married and had children by then, but you still want to take those things slow. Putting a band together feels like even more of a jump, because everything you’ve done up to that point in life has been focused on the music that you make, and you want to make sure that it doesn’t wreck what you have personally. And right out of the gate, it just felt right. It was a slow build, but I was getting to a point when we put this band together where I’d tried to step away from the Allman Brothers and I was ready to step away from my solo band. It just felt like I was ready for a real change. I’d never really put a band together as an adult. I was 15 when my solo band came together and life just kind of happened. I really wanted to give it a go from scratch, and I asked Susan if she was into it, and she was ready to take the jump. I don’t think originally she was as ready as I was, but those opportunities don’t come often, so we decided to just throw everything in one place and go at it. It came together pretty quickly.